Japanese composer, arranger and tenor saxophonist Bingo Miki studied at Berklee School of Music and with the famed composer George Russell before he went back to Japan and started working for Tatsuya Takahashi and The Tokyo Union. Although he was still young and virtually unknown, the Three Blind Mice producer Takeshi Fujii was deeply impressed by Miki's talent and comissioned a suite for a recording project to celebrate the label's seventh anniversary. 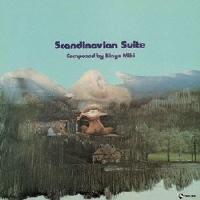 The result was the six-part Scandinavian Suite, the inspiration for which was drawn in part by Miki's experience when he had spent 10 months in Finland, and this ambitious and magnificent recording that stands now as a landmark in the history of orchestral jazz in Japan. Mostly modal compositions and prominent use of synthesizers and electric guitars reflect the time (1977). The performance and recording are equally as brilliant as the composition itself. Produced by Takeshi Fujii. Recorded at Epicurus Studio, Tokyo, on May 15 and 22, 1977, by Yoshihiko Kannari. Blu-spec CD is compatible with all regular CD players. Paper sleeve special limited edition.